Big News about Small Satellites: Cubesats Rule! BIG SKY, Montana--Think small. Think fast. Think cheap. These are the watchwords for an on-going revolution in building tiny satellites that deliver big results. They are called CubeSats. Packed with microelectronics, these ultra-small spacecraft can fly in formation, dock with each other, carry out science duties, inspect other satellites, scan our planet--and might be used to create an actual Earth-orbiting game of "Space Pong." As the name implies, a CubeSat is a cube-shaped satellite having the diminutive dimensions of 4x4x4 inches (10x10x10 centimeters). You can hold one in the palm of your hand. They weigh roughly a couple of pounds (one-kilogram). In some cases, a CubeSat can be comprised of multiple cubes to build a larger, but still very small satellite. It is university graduate and undergraduate students who are mainly responsible cranking out CubeSats for educational and basic research purposes. For example, 14 CubeSats from 10 different universities and one private company will take part in an upcoming CubeSat launch coordinated by California Polytechnic State University in San Luis Obispo. They will be hauled into space onboard a Russian/Ukrainian launch-for-hire Dnepr booster, then ejected like peas in a pod. In fact, the hardware used to that is called a P-POD, but stands for something less colloquial: Poly Picosat Orbital Deployer. Five P-PODs are to be utilized to buckshot the armada of CubeSats into space. CubeSats and other student initiatives were spotlighted during the Inland Northwest Space Alliance (INSA) Space Policy Institute meeting, held here September 16-18. One CubeSat that's ready to fly is the Montana Earth Orbiting Pico Explorer, or the MEROPE project, carried out at Montana State University in Bozeman. "That's our top-priority. To get MEROPE in the air and working," said Dave Klumpar, research professor of physics at Montana State University and head of the school's Space Science and Engineering Laboratory. Klumpar said the experiment is actually a space trek back in time--to the flight of America's first satellite to reach Earth orbit in 1958, Explorer 1. That pioneering spacecraft carried a Geiger counter that discovered a radiation field around the Earth, later to be tagged the Van Allen Belts after Explorer 1 scientist--James Van Allen--made that measurement. "Here we are 47 years later," Klumpar told SPACE.com. "What does modern technology, commercial off-the-shelf hardware, allow students to do now? How would that experiment be done today?" MEROPE will repeat the Explorer 1 mission, using a satellite of less volume and mass, Klumpar said. Not only will MEROPE yield science data, it has also been an invaluable tecaching tool for all those taking part in the effort, he added. "There are very interesting problems that are already in the computer science field that you can apply to these satellites," said Joseph Barzilai, a senior in computer science at Washington State University in St. Louis. Barzilai is part of a student group working on the university's 4.4-pound (2-kilogram) Bandit Inspector Spacecraft capable of autonomous navigation and docking once unleashed by the team's 66-pound (30-kilogram) Akoya nanosatellite. The tiny Bandit would detach and look around the parent vehicle, producing imagery of the larger craft, Barzilai said, then redock with Akoya to recharge itself. "We can use some really cool algorithms that were developed for big mobile robots," he said, so Bandit can learn as it completes assigned tasks. "We are in the process of building and prototyping the hardware, and a ground station is already built," Barzilai told SPACE.com. While Bandit can perform off-Earth jobs - such as relieving NASA of complicated inspection booms and free-floating astronauts of surveying the shuttle's thermal protection tile system - the tiny craft's built-in smarts can be applied to a variety of terrestrial tasks too, Barzilai pointed out, like warning sleepy truck drivers that their rig is going off lane. Robert Twiggs is a consulting professor at Stanford University in Stanford, California - and a leader in the evolving CubeSat saga in tandem with the efforts at California Polytechnic State University in San Luis Obispo. "CubeSats and the universities can take some of the mystery out of getting into space," Twiggs advised. "NASA and a lot of the industry make it sound so complex. The universities kind of slap a few things together and...what do you know...they go up and they work!" Twiggs said the CubeSats help shape future scientists and engineers by giving them real-world experience. Furthermore, students get very creative and innovative in designing the tiny satellites. Even if a CubeSat fails in orbit, "it's not an educational failure," he emphasized. "What we've learned from the satellites we have launched, the more room you give students to put things in...the more things they want to put in," Twiggs said. "If you can fly anything that's going to do something that is a little different, it's exciting to the students," he said. A good example of that point is a new Stanford University Space Systems Design Laboratory CubeSat effort - but designed with kindergarten through 12th grade (K-12) education in mind. The project is dubbed KatySat, short for "Kids Aren't Too Young for Satellites," explained Ben Yuan, Project Manager. Next year is being eyed for a launch given success in fund raising. The price tag of the actual satellite is in the $10,000 range, but then there's the expense of launch--in the range of $40,000 per cube--and other related costs, he explained. "To me, opening up space for K-12 students is just as important as sending astronauts to the Moon and Mars. In fact, getting young people involved in space through something like KatySat increases the relevance of such exploration, by giving students the encouragement, experience and expertise to participate in these and other future missions," Yuan explained. Yuan said the KatySat concept was inspired by the impact that personal computers such as the Apple II, Commodore 64, and IBM XT had on K-12 education. Much of the growth of the information technology industry, Yuan said, was fueled from innovations sparked by individuals who became captivated and motivated by personal computers in their youth. Similarly, KatySat would put space technology directly into the hands of K-12 students. The hope is that a new generation of innovators will be stirred to pursue technological advances in all fields, Yuan said. He sees small satellites as a recent "disruptive" innovation in the space field. "We want more people to be using the technology and understand how satellites work," Yuan noted. "In essence, our mission is to create the 'Apple II' of space." "We think of the CubeSat as the personal computer of space," Yuan said. "If kids are having fun with KatySat...hopefully they are not going to even realize how much they are learning out of this project." KatySat will be the first satellite to be operated by high school students who are responsible for all phases of mission operation, testing, troubleshooting, and planning. 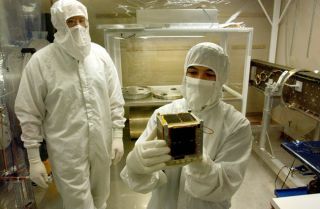 KatySat will carry various sensors such as radiation, magnetic field, and camera sensors, as well as have the ability to exchange messages between students around the Earth. "Making space fun is key to the KatySat program...it's the mantra of our group," Yuan added. Uploading and downloading WAV files to create audio broadcasts around the globe is on tap. In looking into the future, Yuan said that having KatySat circling Earth, the prospect for some variation of Space Pong isn't far fetched. And with multiple CubeSats flying around the world, the opportunities for games would be limitless, he said. "We want the students to run wild with this," Yuan said. "Eventually, we want this to be a sandbox in space...for kids to create their own mission and applications."